I've finally completed my unofficial soundtrack for Daggerfall! My goal was to make the three-hour listen a journey through towns and dungeons, sequencing the tracks to keep things spicy while preventing any jarring changes in mood. I've also dealt with the looping nature of this music in various ways, from adding simple fadeouts to rewriting the last few notes to add a sense of finality. 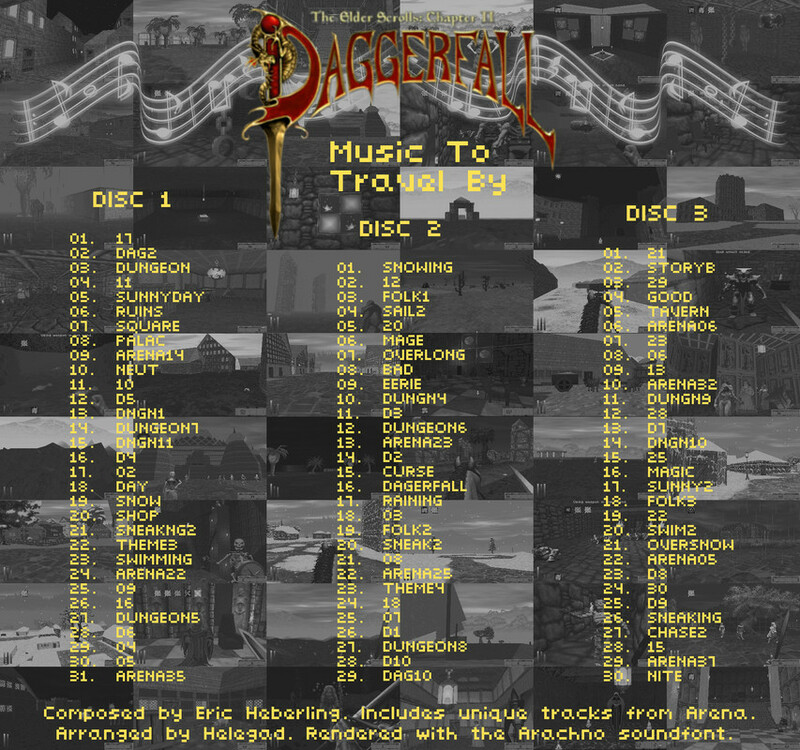 There are no duplicates, all unique tracks from Arena and the Daggerfall promotional download are included in appropriate areas, and I've properly mixed the whole thing from track to track. I've also created some art in case you want to burn a set of CDs! Oh man, everyday is still like Christmas with you guys. Hey can I turn this into OGG files for my game, I can share it with you guys unless somebody has already done it ? Glad you like it Use it however you like. I mixed it up with the dan goodale one, and some other stuff. I changed most of the songs around, put a few ones that aren't used in the game back in, and added some good ones from the conan soundtrack. So no more happy tavern music for me. Its all dark and foreboding spooky stuff. Except the shops, the shops have the sneaking song now..
And I can finally use the sailing song (love that one). Can I make videos with this ? My channel is not monetized, and I will give credit. Like, you really nailed it..
Much of that credit goes to the creators of the Arachno soundfont. But I'm glad you're happy with it all the same. If you want to upload it to YouTube, go ahead. 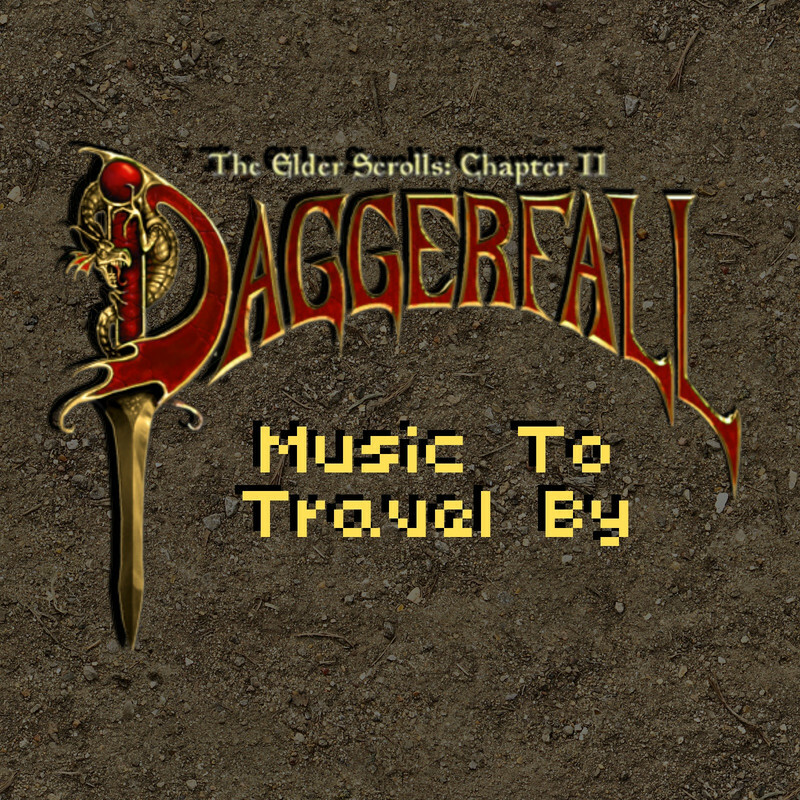 So what I did here was make a new soundscape for Daggerfall. And one I mixed of the main theme ( yours is still in here, and I made it the DFU start up tune). Most of the tavern music is changed (it's still vanilla, but no more happy tavern music making your ears bleed ). The outdoor music is changed (in cities, and in the wilderness ), so no more happy town music. All the good songs are still in there, plus, since there is more than one version, I took out the silly or over the top sounding tunes, and kept the ones that nailed it (usually yours), just so, or I replaced songs altogether with ones that were not actually used in the game (the shop theme is now the sneaking song ). I have been burnt out on the shop song for like 15 years, so yeah.. The dungeon music has a mix of all packs, same with the outdoor music, and with the seasonal as well (the sailing song (one of my favorites in DF period) is now overlong, and I spent a few hours playing last night to see how it all fit. There are a few songs that aren't actually used in the game still, but I don't know which ones they are so I left them (I don't have a complete list of what songs play, what there names are, and when they play, if I did, that would be awesome, (somebody? )), so all that extra stuff, just rename, delete, use it whatever, it's still from your pack, it just sounds so good, I figured maybe someone would want to switch stuff around. Even then, like I said, it's tree packs, and it's not all happy daggerfall music, just the epic stuff, theres still some, and it's not all depressing just kinda spooky..
That main theme is just made for the DFU start-up screen, you kinda have to exp yourself, and if someone wants to grab this this thing, and release it as a mod, it's fine by me. Here you go, if you just want me to do a straight convert of your songs to ogg I can do that to. p.s.If I had a list I could tailor it to what's actually getting used in game (as in names, when the song plays, etc..), so if somebody knows that stuff, let me know, I like doing this stuff.. If you guys want me to share this thing let me know, otherwise look at my YouTube channel, I will leave a Link in the description when I decide to share ( I'm still pondering going through the dungeon songs). Last edited by Midknightprince on Tue Feb 26, 2019 3:23 am, edited 1 time in total.